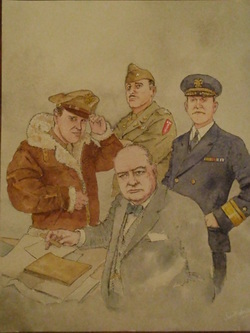 "Steps to Liberty", author Laura F. Marsh, illustrated by John R. Wright. Reading level, ages 6-10. Hardcover, 32 pages, full-color illustrations. Publisher, Junior League of Central Westchester. 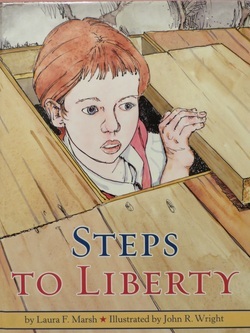 Set in the fall of 1776, "Steps to Liberty" is a children's book of historical fiction. Beautiful watercolor paintings illustrate life in Westchester County, New York during the American Revolution. The events in the book take place at or near Wayside Cottage in Scarsdale and feature the exploits of nine-year-old Michael Varian, who actually lived in the cottage with his Patriot family. The Wayside Cottage still stands today. For information about the Cottage or to order the book, call (914)723-6130. Cover for privately commissioned e-novel. Artwork By John R. Wright. Copyright by the artist, 2012.